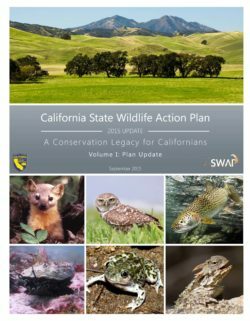 This document will serve as the blueprint for the Department's efforts to restore this prized, and oftentimes overlooked, resource. Restoration of California's anadromous fish populations is mandated by The Salmon, Steelhead Trout, and Anadromous Fisheries Program Act of 1988 (SB 2261) which states that it is a policy of the State to significantly increase the natural production of salmon and steelhead by the end of the century. SB 2261 directs the Department to develop a program that strives to double naturally spawning anadromous fish populations by the year 2000. Steelhead management is often included in, and sometimes lost within, management of the more economically important Pacific salmon. Recognizing this, several legislators along with prominent angling organizations urged the Department to incorporate a Statewide Steelhead Restoration Plan into the initial elements of the SB 2261 program. 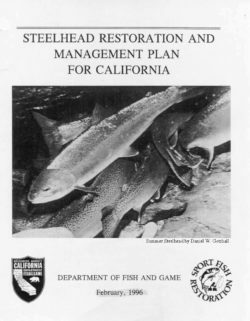 Thus, the development of the Steelhead Restoration and Management Plan for California (Steelhead Plan) has been an important feature of the SB 2261 program since its inception in 1988. Various organizations, principally California Trout, Inc. and Trout Unlimited, remain committed to assisting the Department in its efforts to recover steelhead populations and eagerly await the publication of the Steelhead Plan so that implementation of the identified restoration measures can begin. Many other angling and conservation organizations are committed to the Steelhead Plan and have corresponded with the Department during its development. 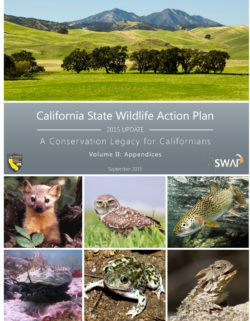 Governor Pete Wilson pointed out in his Water Policy Statement of April, 1992, the urgent need for a long-term, comprehensive water policy that includes safe, reliable water supplies for cities and farms and sufficient water to restore fish and wildlife resources. The goals and recommendations set forth in the Steelhead Plan are consistent with this latter aspect of the Governor's Water Policy. Because steelhead are present within the range of all other anadromous salmonid species in California, and because they use a greater portion of a particular river system than do other anadromous fish, restoration of steelhead habitat will have a salutary effect on many other anadromous fish species as well. The Steelhead Plan is one in a series of documents developed by the Department to address the mandated doubling policy stated above. 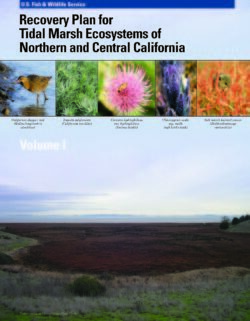 Restoring Central Valley Streams, A Plan for Action was published in 1993 and presents a multi-species approach to restoration of anadromous fish populations in the Central Valley. The Steelhead Plan dovetails with, and is an integral component of, this Action Plan. The Steelhead Plan identifies the life history requirements and needs of an important element of Central Valley anadromous fish ecosystems.